After I fed the cats and chickens today I was walking across the yard to play with Gibby when I heard a crying cat. 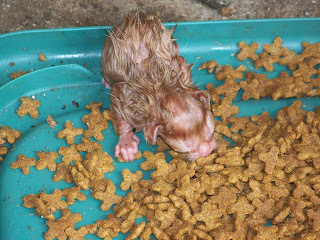 I walked back over toward the porch where I feed the cats and found a newborn kitten on the plastic tray where the cat food is served. It's probably going to be a yellow kitten, but it was still too wet to tell. I went to the car to get my camera and then sneaked back to take some photos. While I was photographing the yellow kitten, I realized the mother cat was having another kitten. I'm sorry she decided to have her kittens on the cement porch, but maybe they just surprised her and started popping out. Blackie, the grand dame of farm cats, is the grandmother of the kittens, and she stopped by a couple times to see how her daughter was doing. Some of the other young cats looked in, saw the baby, and left.